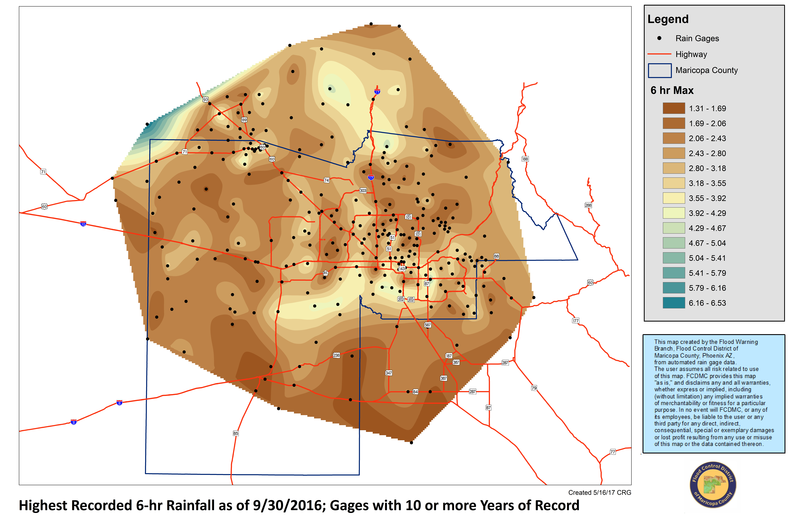 The District has installed and maintains 350 automated precipitation gages throughout Maricopa and surrounding counties which measure the amount and timing of rainfall in real-time. These data are transmitted to the District via radio and stored on the base computers. Data and informational products, real-time and historic, may be viewed using the tools on this page in different formats such as tables, maps and plots. Maximum / Daily, monthly and annual precipitation totals for all rain gages, sorted by amount, ending at 5 a.m. each day. 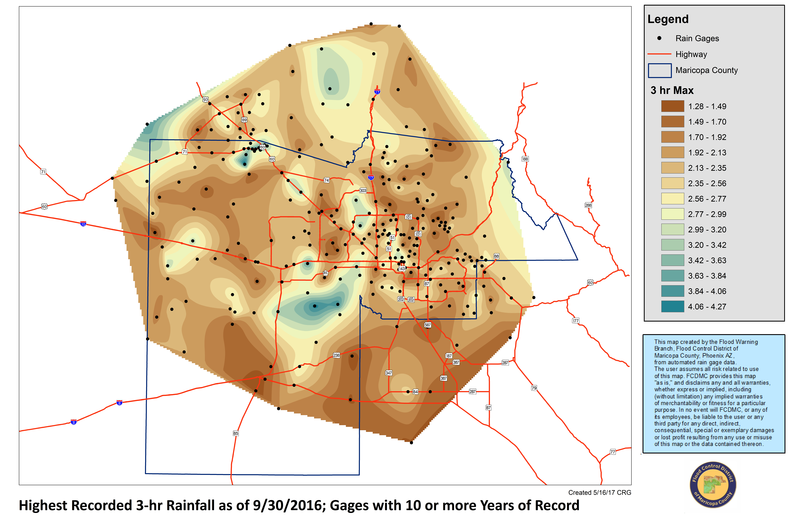 This report contains 6-hour and 24-hour totals at all rain gages, sorted by jurisdiction, updated every 30 minutes. 15-min., 1-hr., 3-hr., 6-hr., 24-hr & 72-hr rainfall values at all rain gages, updated every 15 minutes. Create a historic version of this report. View daily totals at all precipitation gages by month back to October 2010. See our Publications section for prior daily total summaries. View past contoured rainfall maps by storm date. Find annual rainfall total maps by water-year. 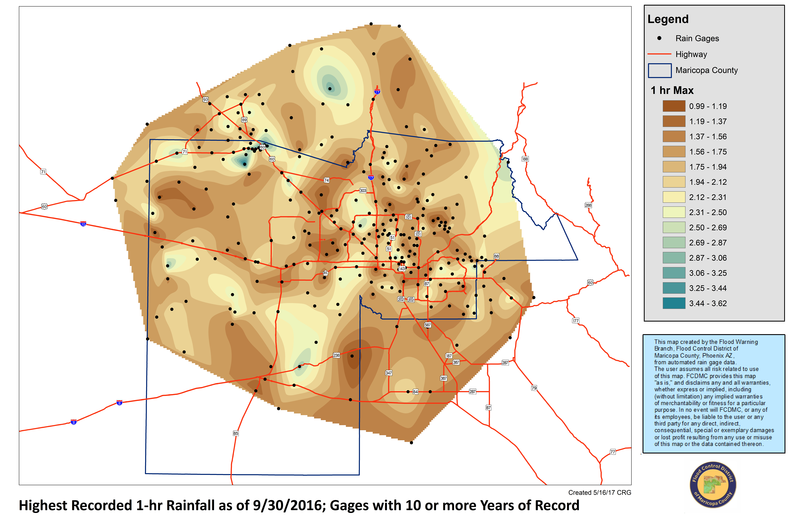 View the maximum period recorded rainfall amounts at stations with 10 or more years of record. Select one of the following time periods. View Summary Statistics and Annual Rainfall Records for Each Rain Gage. Find NOAA Design Rainfall Data. Compilation of Severe Rainfall Events at ALERT Stations in Excel 2010 Format (424 Kb, updated 12/13/2017).